I’m definitely sure that I love any excuse to hit up a restaurant though, and thankfully Valentine’s day is a good one. Maybe I really do like the “holiday” after all. We’ve never been to Bridge before, but we’ve always noticed it and always wanted to try it out. Last night was the night! We loved the atmosphere and decor right when we walked in; not too fancy and not too casual. There was a big fireplace and lots of TVs on all the walls. Technically, it’s not 100% paleo, as there’s a bit of sugar in the rub. We risked it. Ya, we didn’t like it all. Kidding, it was ahhhmazingg. We both wanted more, and almost ordered another one. Cj has already declared this a normal hangout now, just so that he can have the ahi. For my meal, the choice was easy. I requested no cheese and had a chicken breast added on top. Again, not pure paleo because of the sugar, but what the hell. I was pretty impressed that the only “cheat” was a tad bit of sugar. This was so. good. I love it when salads come undressed, so it was a bonus for me. The dressing was super yummy, and so were all the other toppings. Plus, that chicken breast was huge. Dolly Parton huge. I was super full, but not stuffed. 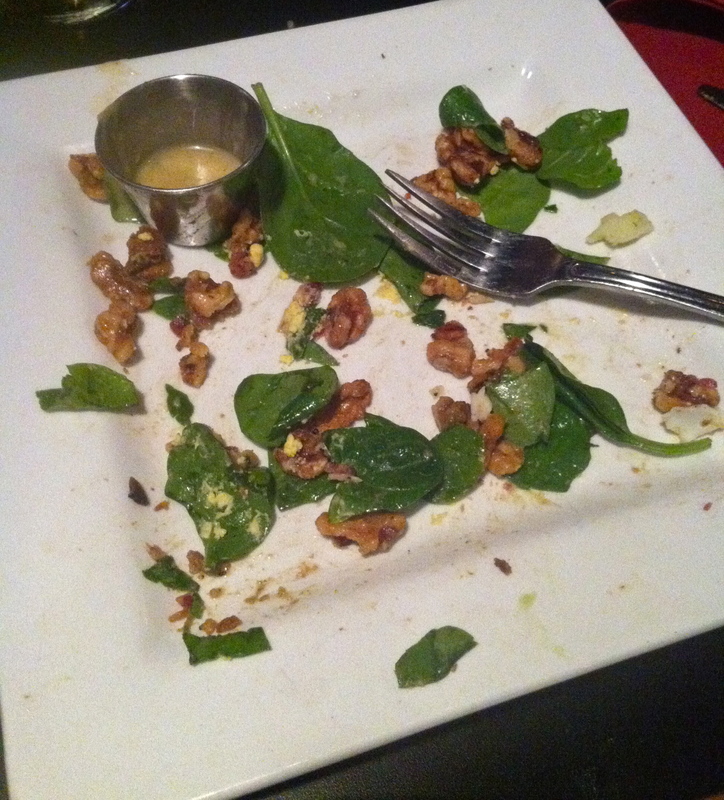 It’s amazing how different you feel after a big salad when you didn’t consume 1/2 a loaf of bread as an appetizer. 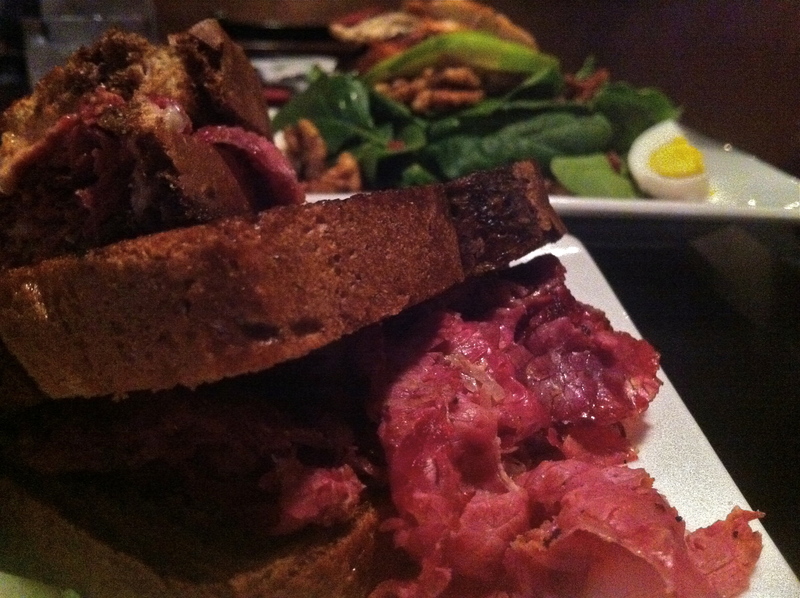 Cj has a new found love: Reuben sandwiches. Cj said it was a perfect reuben. As a blogger I took it as my duty to make sure he wasn’t lying, so I tested the meat. He wasn’t lying. Because his meal had bread (and he’s trying to slowly switch over to paleo eating) he got a bowl of chili instead of fries. Let me tell you, this has NEVER happened before. I was so proud! We’re so glad that we finally tried The Bridge, and we know we’ll be back. Probably too soon. Next Post Oh, it’s Valentine’s day?